Life Fitness, a division of Brunswick Corporation (NYSE: BC), has been the Industry Leader in both home and commercial fitness equipment for the last 40 years. Starting with the invention of the Lifecycle, Life Fitness is the company that has shaped the fitness industry and brought cardio equipment mainstream which helped ignite the health club boom. Today, it is the #1 Brand in Health Clubs and Gyms worldwide. 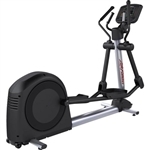 Fitness Superstore carries refurbished Life Fitness Ellipticals, Exercise Bikes (Recumbent and Upright), Steppers, and Treadmills.